I didn't go to the Women's March in Denver on Saturday. I really wanted to be there, however, several months ago, I agreed to do a presentation at tutor training for a local non-profit. It was at the same time as the march and I just didn't feel like I could back out. And encountered what I hope the world will not be like for the next four years. My presentation was about ways tutors could support their English learners. One of the first things I talked about was the importance of building relationships, and helping their tutoring partners to feel safe and relaxed. A woman raised her hand and asked, "But what if my child (her tutoring partner) doesn't feel safe. He cries every week because he is afraid he is going to be deported." At that point, a man sitting right in front of me growled, in a really audible tone, "Let's not get political." I tried to respond to the woman's question as best as I could. I told her that I would tell the little boy the same thing I had told the kindergartners at the lockdown drill the day before. We had been sitting under the table against the wall in the art room and one of the little girls was frightened and started to cry. I told her that she didn't need to worry, (first of all because it was just a practice), and secondly, because it was my job, as an adult, to take care of her and keep her safe as best as I could. That moms and dads and grandparents and teachers always do their best to keep kids safe. And then I went on with my presentation. Over the next 45 minutes, I shared about 15 more strategies. People clapped when I was done, and I thought it had gone ok.
Later I learned that the "not get political" gentleman had gone first to the person in charge of my session, and then to the president of the whole organization, to complain about how political my session was. And even though I know it was only one person and probably not that big a deal, I can't stop thinking about it. I can't stop wondering what the next four years are going to look like. My friend, David, moved away two weeks ago, and I have really been missing him. I met David shortly after I moved into my house seven years ago. He pedaled by on his bike and introduced himself. He told me he did yard work, and that he would be glad to help me out if I ever needed anything. And over the past seven years, David has helped me out. A lot. He laid sod in my front parkway. He moved my lawn. He pruned my bushes. He shoveled snow. He cleaned my gutter. A couple of years ago, a late spring storm knocked down a huge branch that went all the way across my backyard. I wondered how I would ever get it out of there, and how much it would cost. David and his buddies sawed it into chunks and got rid of it within a matter of hours. Sometimes I called and asked him to do work. Sometimes he just showed up and I would come home from work to a yard that had been mowed, or trees that been cut back. Mostly I paid him, but if I didn't have money, he just worked for free. "I got you baby," he would say. "I got you." David is my age, in his late fifties. As far as I can tell, he has spent pretty much his entire life in this neighborhood. As long as I have known him, he has never had a regular job. He didn't own a car, instead he rode his bike all over Park Hill. David knew everyone in the neighborhood. He knew who was having babies and who had died. He was invited to neighborhood barbecues and graduation parties. Whenever someone moved in, David was the always the first person to introduce himself. He was friends with everyone. David hung out with a group of men, all about his age, that all had similar life circumstances. They all drank. A lot. I rarely saw David before ten or eleven in the morning. I knew that he wouldn't be available after about four, because that is when he and his buddies started drinking. In between ten and four, he did great work. Despite his alcohol issues, he was my friend, and I always knew he had my back. David lived about a block down the street from me, in a ramshackle house that he shared with his mother, and any number of other people. Several of the people that lived there were mechanics and worked on cars out in front of the house. My boys didn't like the people at that house. One of my sons insisted that the people who lived in that house had stolen the speakers out of his car. They might have, but I knew David didn't have anything to do with it, because David was my friend. He had my back. Earlier this fall, David told me that his 85-year-old mother was selling her house. I wasn't sure I believed him. Where would she go? Where would he go? Where would all of the other people that seemed to live in the house go? David told me would move to an apartment on Colorado and 17th. It's not very far, and I just assumed I would still see him out and around on his bike. About three weeks ago, the house really was sold. There wasn't a sign, it just seemed like somehow, during the night, all of the people that lived there, including David, disappeared. The next day, men were there tearing out the ramshackle fence and overgrown bushes. They've hauled away three dumpsters full of junk, and workmen are there every day renovating the house. I haven't seen David. He called me one day about two weeks ago. First he asked if I had seen what they were doing to his house. Then he asked if he could move in with me. We both kind of laughed, but I wonder if he was really kidding. I wonder if he really does have an apartment. There's an abandoned motel at Colorado and 17th, and I wonder if he might be living there. We've had a couple of really cold spells and I'm wondering if he is somewhere warm and if he has food to eat. I miss my friend David. It's hard to find people who have your back. Next week, events which seemed totally impossible a year ago, will occur. And I can't wrap my head around it. And I don't know what to do to make the world less ugly. Or less unbearable. So I just keep doing the tiny kindnesses that I can do. Tying a kindergartner's shoe. Helping a fourteen-year-old call the admissions office at the high school she wants to attend. Carrying on a conversation with my son at the end of a fourteen hour school day. Being gentle with people I love. Knowing that is not nearly enough. Hoping it will be. Keri is hosting the Poetry Friday Roundup today. Every week I tell myself I am not going to be a late Tuesday slicer. I'm going to write my slice over the weekend. Or at least on Monday night. I am not going to write it Tuesday night. 1) My Christmas fit bit. Today I walked 11, 033 steps. Pretty sure that is the most I have walked so far. I had a four day 10,000 step streak going, but then the dog had surgery and I lost my walking partner, and then it got really, really, really cold and blizzardy and it was hard to think about walking outside. The day after I got it, there was a thing on the news about how fitbits really don't help you lose weight. And I can't figure out how to sync it to my computer. 2) The boys- it's been a pretty bumpy stretch. I wonder if we will ever get past this. Or if things will ever, ever, ever get better. Not much I want to say publicly beyond that. 3) School-- The kids came back yesterday, and I was really really really glad to see them. I love being a teacher. I walked 11, 033 steps today, and about 10,000 of that was at school. 4) Hobbies- I really want a new hobby this year. Something that has nothing to do with words. And involves creating. But I don't know what. It happens pretty much every year that I am a CYBILS judge. There's one book that I love, love, love, that doesn't make the final cut. It was true again this year. One of my favorite books, Ashleyy Bryan's FREEDOM OVER ME, was talked about a lot, but didn't make the final cut. 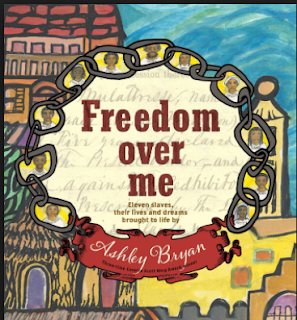 In the author’s notes, Bryan says, “Many years ago, I acquired a collection of slave-related documents. They date from the 1820’s to the 1860’s…(I used) Fairchilds Appraisement of the Estate document from July 5, 1828 to tell this story." The book begins with a poem by Mrs. Mary Fairchilds, the mistress of the estate. He managed our estate alone. 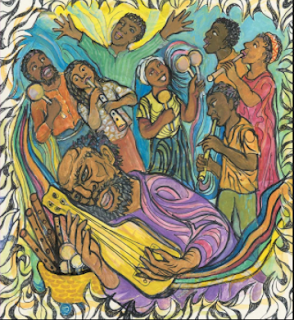 The remainder of the poems in the book tell the stories of the eleven slaves, with two poems for each. The first poem is about the slave's "outer" life- where they came from, the work they do on the plantation, who they are married to, etc. The second poem tells about the slave's inner life- their hopes and dreams and fears. There’s Peggy- age 48, the Fairchild’s cook, selling for $150. What she cares about, what she loves, is being called the herb doctor. There's Stephen, age 32, a carpenter, selling for $300, who loves Jane, the plantation seamstress, also selling for $300. Given his choice, Stephen would design and build homes in all climates of the world. He dreams of a proper marriage to Jane. Stephen and Jane care for John, a 16-year-old slave who dreams of being an artist. 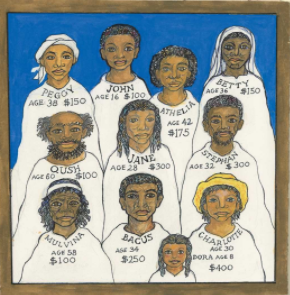 Other slaves include Athelia, age 42, the plantation laundress, $175, Charlotte, age 30, and her child Dora, age 8, selling as a pair for $400. There's Charlotte, a basket maker, who jumped the broom, with Bacus, the blacksmith, and Betty, age 36, a flower Gardner, who will be sold for $150. Qush and Melvina, both around 60, will be sold for $100 each. Ashley Bryan's illustrations are, as always, absolutely terrific. This book could be used with younger children, but could easily be used in a high school classroom. I'm planning on buying a copy for our eighth grade American History classes. I was really disappointed that this one didn't make the cut. I loved it! I promised myself that I was going to participate in Poetry Friday every week in 2017. Unfortunately, I had to do a presentation this morning, and wasn't quite ready, so I spent last night and this morning pulling that together. Even though I'm too late for Poetry Friday, it's still Friday, so I'm having my own poetry party! Today I'm featuring one of the books that got away, a CYBILS nominee that provoked lots of discussion, but didn't quite make the cut. 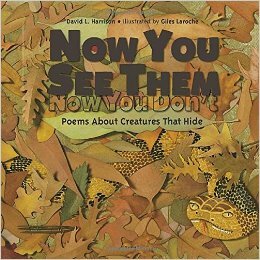 NOW YOU SEE THEM, NOW YOU DON'T: Poems about Creatures that Hide is David L. Harrison's newest book. Poems are divided into five sections- sea life, reptiles and amphibians, mammals, insects and spiders, and birds. End notes include an informational paragraph about each of the 19 featured animals. Giles La Roche's 3D collage illustrations are sure to fascinate young readers. These poems and paragraphs would be terrific mentor texts for young scientists and poets! Fellow Denverite, Linda Baie, is hosting POETRY FRIDAY over at Teacher Dance. Head over there for a lot of great poetry. Let other people give the diaper bag and onesies and cute little clothes. I have always, for as long as I can remember, given books as baby shower presents. And for the past couple of years, a book I always include is Marla Frazee's BOSS BABY. 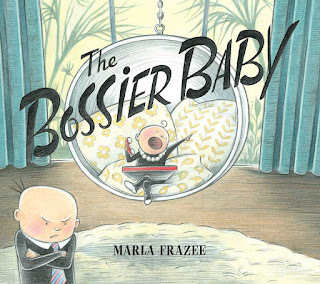 Frazee has a new book, THE BOSSIER BABY, that has just become my all time favorite big brother or sister present. In BOSSIER BABY, a new CEO (complete with pearl necklace) has arrived, and the corporate structure has changed dramatically. The new CEO is getting all the perks- organic catering (nursing) and aroma therapy (diaper changes). BOSS BABY is less than thrilled, and retreats to a corner to sulk. You can probably guess who reaches out to bring him into the corporate structure. I've been reading slices all day. It seems like many, maybe even most, are using their first post of the year to identify their One Little Word (OLW). I would like to do that. I really would. But I'm having a hard time choosing my OLW. On one hand, I want my OLW to be ORDER. I know that's crazy. Not very glamorous. Or uplifting. Or soul stretching. But ORDER is a word I really like right now. I think it's because, as a general rule, I'm such a disorderly person. I'm horrible at housekeeping. And bill paying. And paperwork. And I drive myself crazy. I'm really longing for order. I want to be one of those people who has a clean house. And pays bills on time. And doesn't spend half of her life looking for things. I think ORDER would be a terrific word for this year. But on the other hand, I'm longing for less predictability in my life. For years, I have been a single parent. And for a long time, my life pretty much consisted of working and taking care of my boys- feeding them, doing laundry, doing homework, taking them to practices, attending games, etc. I loved that life, but it's over now. The boys are pretty much grown. They don't need me to take care of them anymore, at least not in the same way. I've had a hard time, the last couple of years, figuring out what I want my new life to look like. I pretty work a lot of hours, come home, walk the dog, do more work, go to bed, get up a few hours later and start all over again. On Saturdays I clean and grocery shop and do errands, and on Sundays, I go to Colorado Springs to see my mom. Yeah, there's a little reading and a little writing, and a little practicing Spanish, and a little time with friends, but it's pretty much same old, same old, same old. I really want to make some changes this year. I want to learn something new. To draw or to paint or to make something. I want to find something else, besides work, that I love. And for that reason, I want my one little word to be CREATE. I'm having a hard time choosing one little word. ORDER? CREATE? Can I have two little words?